While your stay in Paris, you can go shopping in one of the many commercial streets of Paris : in clothes’ shops and in specialized stores. Discover different places for shopping in Paris. Where to go shopping on the Right Bank of Paris? In the neighborhood of Châtelet you will find two large places for shopping. 1. The BHV in the Marais is a place that sells fashion accessories, designer clothing, cooking utensils and cultural objects. 2. The underground gallery at Les Halles offers a variety of shops selling clothes, shoes, books, cooking utensils, jewelry and beauty and perfumery (Sephora, Bourgeois for cosmetics and Minelli and San Marina for Shoes for example). GOOD TO KNOW: the gallery has been recently renovated, you will discover its new architecture outside and new shops and restaurants to eat. 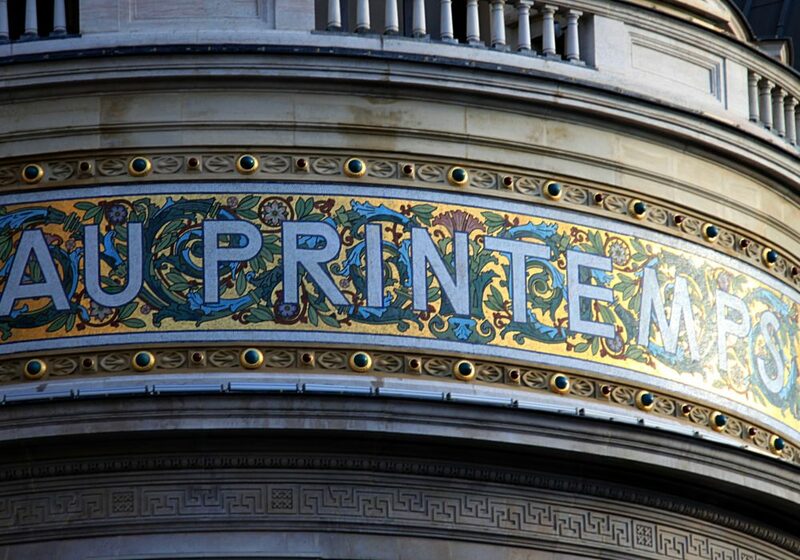 Further North in the neighborhood of Saint-Lazare you will find the famous store the Printemps and the Galeries Lafayette which offer the same types of items as the BHV. The Galeries Lafayette also offers food products. The Franc-Bourgeois street in the Marais purposes various trendy clothing stores such as Zadig and Voltaire or Mellow Yellow. You will also find cosmetic products from the Bobby Brown or Kiehl’s brands. The street of Rivoli offers traditional stores such as Promod, Yves Rocher, Bocage, Sephora or Mango. The street Saint-Anne on the side of the Pyramides district is full of shops of Japanese products. The Saint Pierre market at Barbès offers many fabrics and accessories for sewing. Where to go shopping on the Left Bank of Paris? The shopping center Italie 2 in the south of Paris has traditional brands such as Promod, Camaieu, Zara and Fnac, and offers food shops such as Kusmi Tea or fruit juice stands (Zumo) by example. The rue de Rennes in the sixth neighborhood invites you into the traditional clothes shops (Naf Naf, Pimkie, Zara, Etam …) and offers some atypical boutiques (toys store, plastic accessories). Not far from there, in the boulevard Saint-Germain, there are shops of the brands Sisley, Carroll, Bruce Fields. Where to go for shopping in Paris ?